A woman who tried to break up a large brawl in Bewbush was left in agony after she was hit by a car, a court heard. 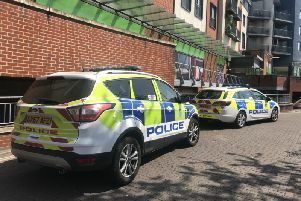 Hansley Robertson, 25, of Britten Close, Bewbush, Kenny Robertson, 23, of Martyrs Avenue, Langley Green, Doris Robertson, 49, St Aubin Close, Broadfield, and a 17-year-old boy appeared at Lewes Crown Court today (Tuesday September 22). They are each charged with violent disorder and affray and Kenny Robertson with dangerous driving in relation to a fight near the entrance to Bewbush Community Park on July 27 2014. A witness told how she was struck by a car after she attempted to break up the fight. The court heard she was walking to a shop to buy a bar of chocolate when she saw up to ten men and youths fighting. She walked away but stopped nearby to talk to a neighbour, while more passers-by stopped to watch the fight. The youth with no top collapsed on the floor and was bleeding, he added.